After capturing central and southern Canaan, Joshua took his forces northward to Hazor. Josh 11:1-4 In c.1405BC, the kings of the north join forces to attack the Israelites. 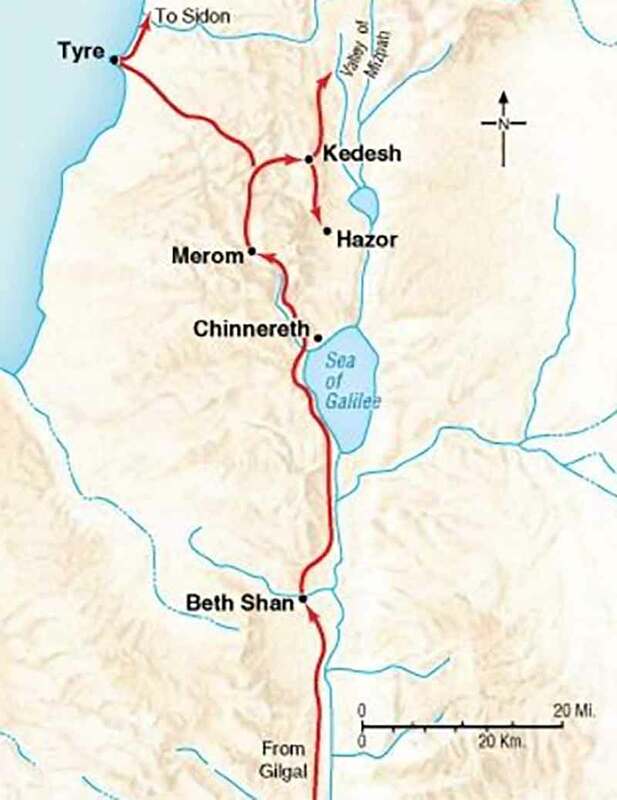 They include King Jabin of Hazor, King Jobab of Madon, the kings of Shimron and Achshaph, kings of the northern hill country in the mountains west of Lake Kinnereth (meaning ‘the harp’ – the Sea of Galilee) and on the coast near Dor, and the Hivites below Mt Hermon near Mizpah. Josh 11:5-9 Joshua approaches their camp at the Waters of Merom (Lake Merom, north of the Sea of Galilee) and launches a surprise attack. The Israelites win a resounding victory and pursue the enemy as far as Misrephoth Maim, Sidon and the Valley of Mizpah. Josh 11:10-11 Joshua captures Hazor and kills King Jabin. Hazor was situated on high ground overlooking Lake Merom in the Jordan Valley to the north of Lake Kinnereth (the Sea of Galilee). 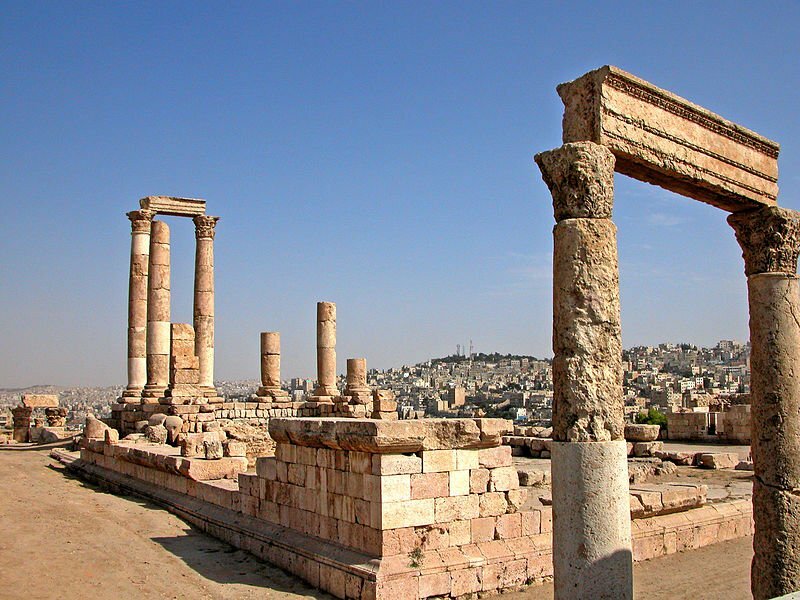 It guarded a steep-sided pass on the main trade route to the north, and had become the largest and most powerful city-state in Canaan at the time of the conquest by the Israelites. When its ruler, King Jabin, heard of the success of the Israelites over the southern cities of Canaan, he assembled the armies of Hazor, Madon, Shimron, Acshaph and some smaller towns at the Waters of Merom (Lake Merom). Using their most successful tactic – a surprise attack – the Israelites defeated the Canaanite confederation and King Jabin was killed. 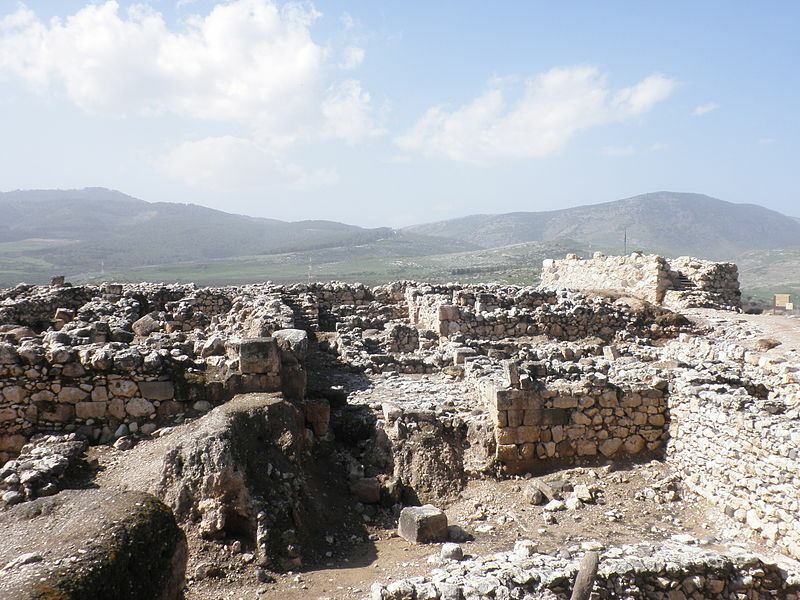 The city of Hazor was burnt down and razed to the ground. The heat of the fire consuming the cedar-panelled walls of the palace was made more intense by the enormous stocks of olive oil that burst into flame. Archaeological excavations at Tell el-Kedah - the site of Hazor - have revealed the remains of King Jabin’s palace underneath a metre-thick layer of ash and debris, as well as more recent remains dating from the reign of King Solomon when the city was rebuilt (see 1 Kings 9:15). These later remains include a magnificent six-chambered gateway (similar to the one built by Solomon at Megiddo) and a deep shaft and tunnel leading to an underground water supply (again similar to the water system at Megiddo). Hazor remained an important city of northern Israel until it was captured and destroyed by King Tiglath-Pilesar of Assyria in 732BC. 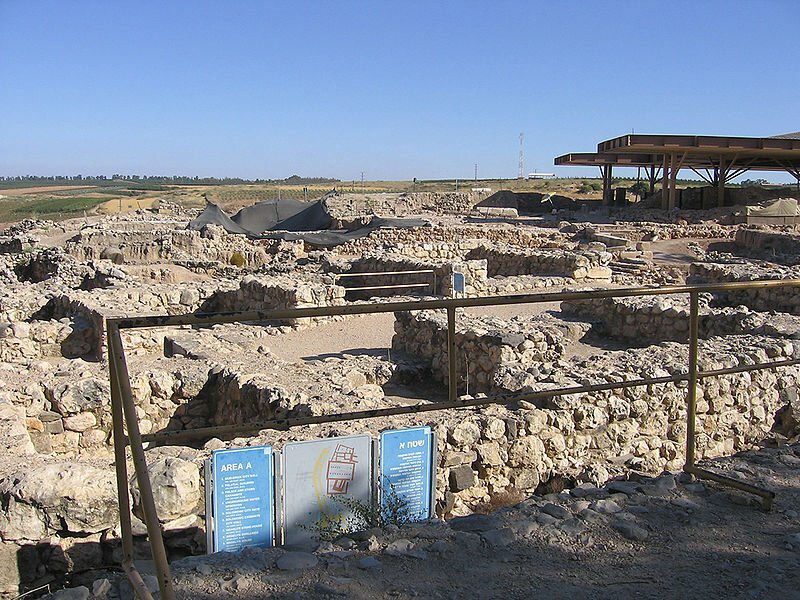 Archaeological finds from the Canaanite and Israelite cities can be explored on site at the Hazor Museum.